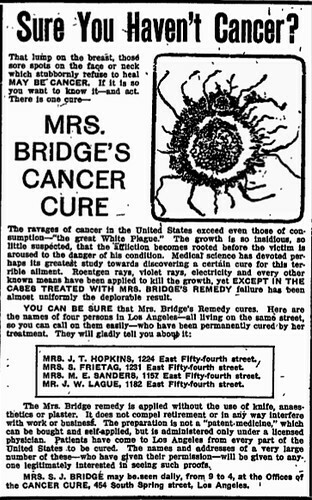 Mrs. Bridge’s unusually graphic ad for a cancer cure appeared bi-monthly in the LA Times. In 1906 she was prosecuted for practicing without a license, but managed to circumvent the law by joining forces with the licensed physician Dr. J.C Hewitt. This end-run maneuver worked for her until October, 1908, when she was brought up on similar charges in the wake of the death of one of her patients, a pillar of the Pico Heights Methodist Church, Mrs. F. W Vandenburg. Mrs. Vandenburg suffered from advanced breast cancer, and rather than undergo the surgery her doctor recommended, she opted for an alternative therapy, namely Mrs. Bridge’s miracle cancer cure. The cure included the application of a common topical treatment for lesions at the time. The ‘healer’ would apply ‘cancer paste’ or carbolic ointment to the external affected areas, a practice that licensed physicians claimed resulted in the cancer retreating deeper within the body to attack internal organs. Mrs. Bridge and other non-licensed healers alleged the carbolic paste drew the cancer poison out of the victim. Whatever its efficacy, one thing was evident: the treatment caused excruciating pain. Pain which Mrs. Vandenburg bore weekly, at the cost of $15 per treatment, and then daily in the last three weeks of her life. During these last house calls Mrs. Bridge administered the cancer cure alone, without the presence of her beard, the properly licensed Dr. Hewitt. After Mrs. Vandenburg’s death the LA Health Office jumped on the opportunity to prosecute Mrs. Bridge for medical fraud. We can only assume Mrs. Bridge did not fare well in court, as she swiftly moved her offices to the Majestic Building in the 400 block of South Broadway, notably without the accompaniment of Dr. Hewitt. 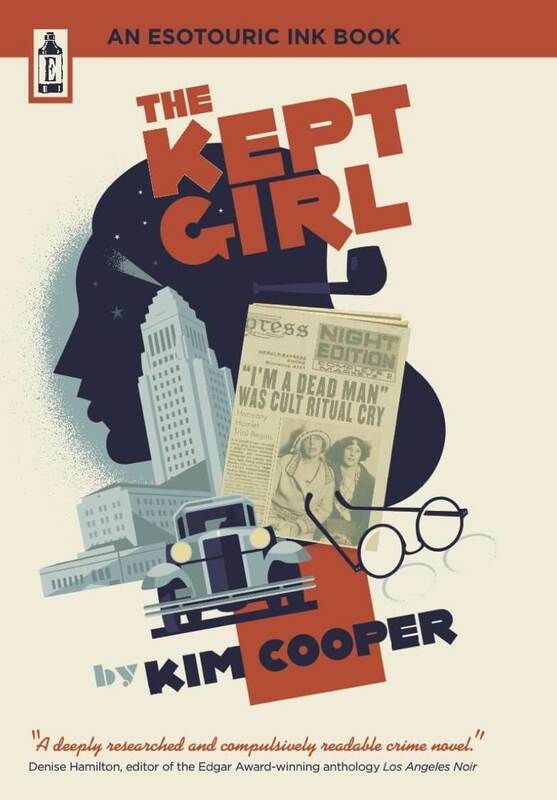 Another clue — her advertisements in subsequent years became much more discreet, eventually shrinking to the size of footnotes, before disappearing altogether after what appeared to be a close-out, everything must go sale of cancer cures in 1913.